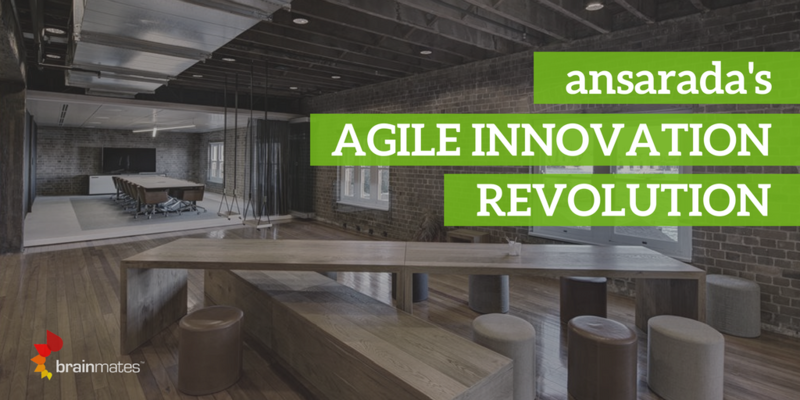 We are big fans of organisations that use Agile Innovation to develop products that their customers love. So when the good folk at ansarada were keen to share their recent Agile Innovation story we were all ears. 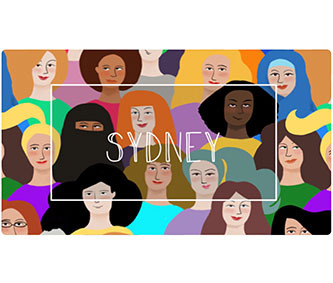 The story is based on a presentation by Matthew Brown, Chief Product Officer and Tim Clipsham, Product Designer for ansarada at a recent Product Talks Meetup in Sydney. The candid portrayalMatt and Tim provided of their product redesign provides essential learnings for anyone in Product Management looking to enhance their Agile Innovation approach. At Brainmates, Agile Innovation is a cost effective way to build just the right products that your customers love. The focus is on learning early in the process and bloody-mindedly using customer needs to prioritise what is delivered in a product. Perfection has no place in an agile innovation world. ansarada is a provider of virtual data rooms designed exclusively for merger and acquisition activities around the world. Their vision is to revolutionise the way M&A business is done. A core element of its value proposition is to deliver a superior user experience in a high performance environment. Take a look at this infographic that contains some cool facts about ansarada. You can click on the infographic to make it bigger, or just click here. Recently the team decided it was important to redesign the existing software technology used by their customers, as a meansto give them a solid foundation for continued competitive advantage into the future. The mission was to re-skin the existing product 1:1 (feature for feature), within three months. There was no scope for additional functionality – just a new interface of the existing product. The project started off OK, the technical development team looked to change the behind-the-scenes code into a more modular format. However, when the design team was engaged the amount of work being discovered started to balloon. The project started to come off the rails. Six months into their initial three month project and it felt like no real progress was being achieved. A core contributor was that there was no key owner in the project. Morale in the development team was down and the project was looking bit like a looming disaster. With no project owner there was a severe breakdown in communications across teams and expectations across the business were not being set and met. Whilst this was all happening the market still wanted product enhancements. The sales organisation field these customer requests on a daily basis and continued to submitthese requests internally. But, these were not within the product redesign scope, so they were not being prioritised. They were just being put to one side for review, at a later date to be determined. Something interesting to note is that ansarada did not have product managers at this point. Establish an owner: an owner for the product (and project) was established. This was Matt, the Chief Product Officer. Morale: give the team and customers a vision to believe in and a path to success. Team morale had to be raised to improve performance and engagement. Forget big bang – go in increments: The iterative nature of Agile Innovation is really how the project was able to get back off the ground, build a sense of achievement and deliver on what was most important for the customer first. Define ‘Done’: prioritise all tasks and broadly communicate it across the teams in the business. Make them measurable and readily attainable. Also, be crystal clear on the benefits are of what is being delivered. Communicate and manage: communicate often internally and with customers to manage expectations and garner buy-in and support. Release management: a process was established to get regular release updates flowing. It involved key stakeholders in the business where responsibility was shared. The process supported a rapid release schedule with frequent updates based on the highest priority items to be done first. 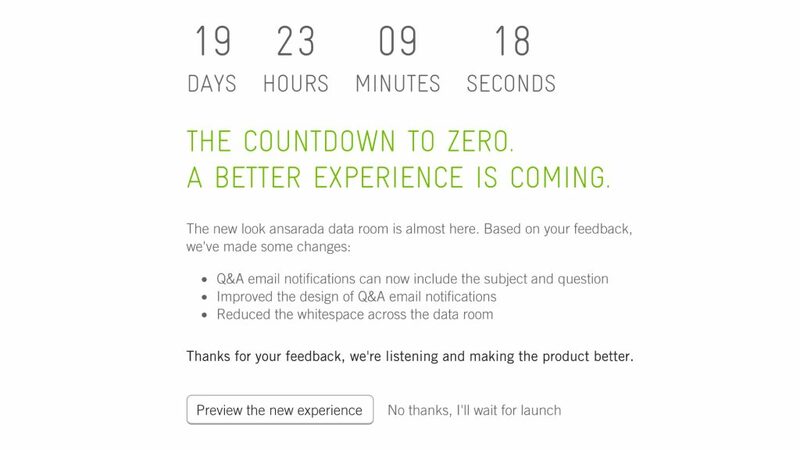 Engage customers early: invite customers to participate in the early releases of the redesigned product. ansarada welcomed active participation in the early releases of their redesigned product. In the end, the project was a success for the business. The teamis proud of what they have achieved and feedback from customers has beengreat. The project took a year from start to end – way over the original estimate. But what was discovered throughthe process is that the project, once running correctly, took a reasonable amount of time. The initial expectations were wrong and caused a lot of the initial discontent. Apart from a new product, the other valuable dividend that came from the process was a new way of doing business. 1:1 feature match was the wrong objective from the start: with a change in interface there were new ways to deliver capabilities to customers which simplified the user experience. Continuous Improvement: by changing the way this project was treated, expectations were more effectively managed. The project was shifted from a singular effort to an ongoing activity for the product. This was then the basis for getting shared agreement on what were the most essential elements for release. In the first version there weresomerough edges, but the product wasrapidly iterated and improved quickly. Look for quick wins: the decision was made to incorporate some ‘quick win’ enhancements to the product. This reallyhelped enthuse customers and convinced them that the product was genuinely advancing and offering more value. Excluding quick wins from the initialproject scope was a mistake and caused unnecessary stress. Customer engagement was key: the early-and-often engagement of customers was a key basis of success. Naturally there is a proportion of your customer base that is risk adverse. But there are customers that will opt-in to early builds. Those users then provide essential feedback on how the new builds are being received and whether new value is being created. When this happens early in the development process then the learnings also start early. Product Management saved the day: I may be extrapolating a little more than what was intended in the presentation, but the project’s success depended on a key owner – someone that sits between tactical and strategic – someone who can interact with customers, sales, management and development. This is the playground of a great Product Manager. Organise teams for success: there was a lot of wasted time from the misalignment across teams in the early phases of the project. The company learned from this and has now restructured the way the product teams work together,to enhance communication and ownership. Product Management is a core element of that restructure. 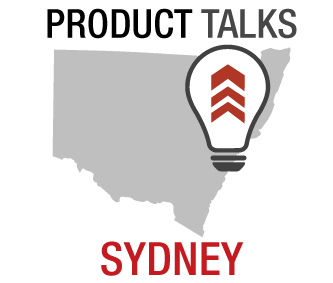 You can watch Matt and Tim talk about the ansarada product redesign at a recent Product Talks Meetup in Sydney (The video is about 42 mins long). ansarada is on the cutting edge in product management practice because that helps them realise their visions -to be a Australian technology success story – a place for other technology companies to aspire.ansarada is on a mission to revolutionise Mergers and Acquisition (M&A). They offer the only virtual data room designed exclusively to simplify M&A due diligence.Their point of differencecan be defined in two words: sophisticated simplicity. ansaradaoffers highly sophisticated data rooms tailored to the specific needs of due diligence, thatremain simple and intuitive to use. From Sydney to Chicago, London to Ho Chi Minh City, ansarada is growing fast. They areone global team with one goal, blended with a bit of local culture. Despite this global footprint, Product Management practice is based in Australia and is now at the very core of their Agile Innovation approach to delivering product. Why not follow ansarada to learning of their latest innovations and upcoming Product Management career opportunities. Such is ansarada’s passion for great Product Management they chose to be a proud sponsor ofthis years Leading the Product conference. You can meet Matt and the team at the event. It is a great chance to learn more about the culture at ansarada and what it is like to be a Product Manager there. 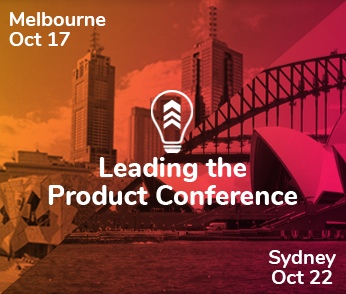 If you haven’t book your ticket to Leading the Product just yet then you can do so here.